Ozil on the field vs Cardiff City. English clubs did not get the full packaged experience of the usual transfer window buzz, as it shut earlier in the Premier League this season. Arsenal was lucky, though. They managed to bring in much-needed strength, and they didn’t lose a single key player. This meant a successful transfer window with fans now looking to the pitch to find the expected results. Yet, there is still the unsolved matter of players feeling unsettled. Mesut Ozil has been on the negative side of things since before the season started, both from club fans and country. It is possible that everything going on can unsettle him and trouble him psychologically. 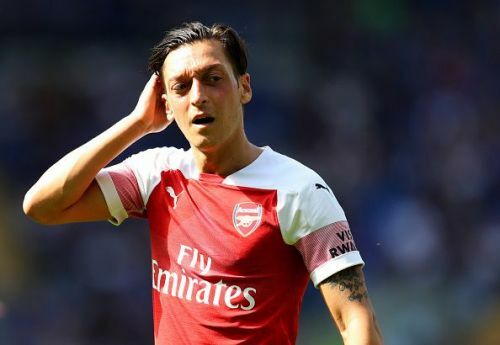 At least that’s what it’s beginning to look like, with Potomac reporting interest from Fenerbahce, and this wouldn’t be the first time Ozil is being targeted by the Turkish club. It doesn’t entirely help Arsenal that Ozil has spoken before about playing in Turkey as something he would consider. Worse, Fenerbahce has, season after season, been keeping an eye on the enigmatic playmaker, who might look at their advances as worthy enough to change teams. Why can’t Arsenal sell him though? Because they will lose a star playmaker. Arsenal can, literally, not afford to lose him. He is a pivot in the team, and he can run the game. Let’s be frank here: Almost every time Arsenal has played badly, everyone has blamed Ozil. You know why? Because that’s just how good he is. Remove him totally from the team, and Arsenal will suddenly lack the creative source he carries. At a point when Arsenal seemed likely to lose both Ozil and Alexis Sanchez, Ozil signed a new deal to assure fans of where his loyalties lie. Clearly, they lie with Arsenal, as he has shown so far. But, if he’s pushed mentally with all the sparks and attacks coming his way from the media and “fans” of the club, he may be pushed in the direction of Fenerbahce. As much as he has struggled to adapt to the post-Wenger era, and can’t find middle ground with Unai Emery, Arsenal would be smarter to assure him and keep him, rather than leave him to go.